A team of Iranian researchers from the Rice Research Institute of Iran have discovered that Gynnodomorpha permixtana, a well-known moth species from Europe and Asia, has changed its host preferences in order to adjust to Iran's northern region environmental conditions. The importance of this adaptation for biological control of problematic weeds in rice fields and the biology of the moth on new host plant have been described in the open access journal Nota Lepidopterologica. 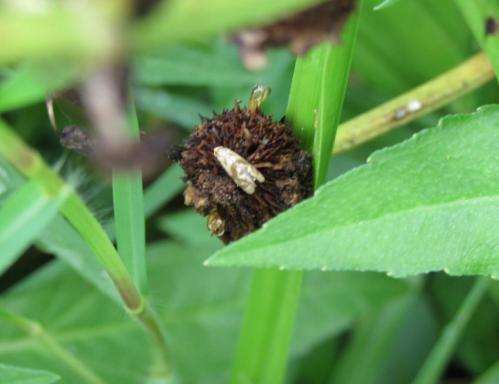 The larvae of G. permixtana have been so far reported to feed on the seeds and flowers of plant species such as water-plantain, eyebright, lousewort, bitter root and European yellow-rattle, which are weeds commonly present across Europe and Asia. 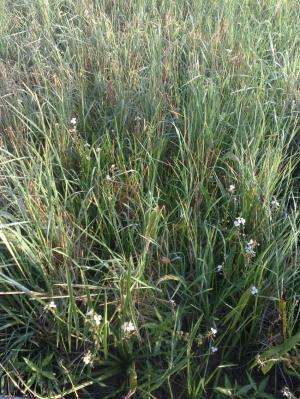 A new study of the populations in northern Iran, however has revealed a new host - Sagittaria trifolia, commonly known as arrowhead. This new discovery suggests that climatic and environmental conditions in northern regions of Iran resulted in the choice of a new new host plant, and provides an exciting insight into how adaptation mechanisms work. Arrowheads are groups of problematic perennial broadleaf weeds that thrive in rice fields and waterways. Favorable climatic condition after rice harvesting results in continued activity and thriving populations throughout the year. The economic importance of this weed has prompted researchers from the Rice Research Institute of Iran to seek for possible solutions for the management of arrowhead. Their studies have revealed that the larvae of a certain moth species feeding on the fruits and seeds of the problematic weed, can lead to a dramatic decrease of its germination potential. After this discovery the moth was sent for identification to Dr Leif Aarvik from the Natural History Museum, University of Oslo, who have diagnosed the species as the commonly known G. permixtana, which was in this case demonstrating a very uncommon host preference. 'To our surprise, it looks like this moth chose new host plant in Iran. This moth was reported in 2009 from the northern regions of the country, but its host plant was unknown. Its usual host plants, such as water-plantain, also grow in Iran but peculiarly we couldn't find its damage symptoms on them. That made this moth host range and biology in Iran rather mysterious at that point, and the recent discovery of arrowheads as its preferred host in the region brings even more peculiarity in the story.' commented the lead author of the study Atousa Farahpour Haghani a Phd student from, Rice Research Institute of Iran. 'Many factors can possibly influence host plant choice including food quality and quantity, climatic conditions, synchronization, physiological conditions in both insect and food plant, genetic modifications etc. Some of these factors are not stable and change in different environmental conditions, so an insect can change its choice of food plant on the basis of seeking the most beneficial complex of factors. It seems that in the northern regions of Iran, and luckily for rice crops, the problematic arrowheads present the best choice for G. permixtana.' added Haghani. Can indigenous insects be used against the light brown apple moth?